I wanted this to be AMAZING. Because it’s Sarah Beth Durst. And there’s a stunning Asian model on the cover. 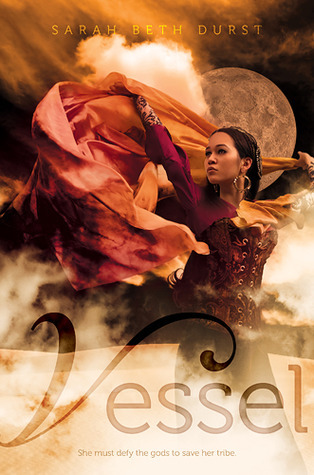 But VESSEL didn’t blow me out of the water, though it was still a fine and unique fantasy geared more towards younger fantasy fans rather than jaded, crotchety SFF readers with high demands for world-building, plot, and characterization (a.k.a. me). Right out of the gate, VESSEL stands a head above others of its ilk because of its protagonist, Liyana. With her slightly snarky sense of humor, especially when she’s with family, Liyana drew me to her immediately…which helped through the rougher periods of the book, when the features that often drag down a quest-based plot—new characters introduced much too quickly to fully capture readers’ support, a whiplash-inducing quick pace that makes it more difficult for readers like me to remain invested in the story—reared their heads. As with one of Durst's previous books, Enchanted Ivy, in VESSEL, I sometimes found that I had difficulty keeping the thread of what was going on. Didn’t they just arrive in Place B, and why do they have to move on to Place C so quickly? Weren’t he and she fighting only a few pages ago? The constant barrage of questions going on in my head as I struggled to figure out which of the many minor characters introduced were truly significant, what romance to focus on, which interactions were actually important to the overall plot, really took me out of the story, so that at the end of this swashbuckling desert magic tale I closed the book with a little, “Huh.” It was a decent enough read for me, but several months on from when I read the book, I’m not sure how much of it stayed with me at all. Cover discussion: Do I even have to say anything? Do I really have to explain to you why I like--nay, love--this cover so much? Review copy received from author and publisher. Thank you for giving me the opportunity to review it! Several years ago I attended an author event in New York City, where the authors on the panel were asked which they would choose if they could only read or only write (not both) for the rest of their lives. At the time I just thought to myself that it was a cruel, cruel (but fascinating!) choice to give a bookworm or writer, and that fortunately it's not a very realistic question, but the question has been on my mind lately in light of my recent struggles against my own thoughts and emotions. Up until a few months ago, I would've probably told you that, if absolutely forced to choose one, I would rather be able to read--and not write--for the rest of my life. There are just too many books in the world that I want to get around to before I die, and the low panic that would set in whenever I thought about the books I haven't read yet if I died early made the choice a relatively easy one. BOOKS. NEED BOOKS. NEED BOOKS LIKE AIR. And so on. But in the last month especially, I've been writing just about anything and everything I can think of. Endless, rambling journal entries in which I try to be my own therapist and think my way out of my mental black hole. Postcards, on which each word is chosen with care to best complement the image with such a limited amount of space. Revealing blog posts. Letters to old, almost-lost, newly-refound friends. Short stories that blossomed out of a split-second scene I caught outside the bus window. Longer stories with little plot but chatty characters, or too much plot that I haven't yet been able to untangle and smooth out. Even text messages, 160 characters used as a lifeline, reaching out to people who can entertain, distract, help, or enlighten me. All of this writing has not just given me a permanently cramped right hand and inkstains that mysteriously appear on my clothes, scarves, and bags. In seeking the writing mode as often as possible, I have actually felt myself feeling better. I enter into writing with a hazy mind and annoyances dripping off me like salty beads of sweat, and on the other side of the writing I emerge clear, calm, and centered. It's not the only answer I have to seek, but when something can make me feel better, I'm going to hold onto it as hard as I can and care for it until the end of my time. Writing is my therapist. Writing is my toughest coach. Writing is the annoying relative who won't leave you be to wallow by yourself. Writing is my best friend. So I guess that if you asked me again which one I'd choose, I'd now say that I need writing to survive. What about you? If you were forced on pain of death (noooooooo!) to choose between being either a reader or writer (but not both) for the rest of your life, which would you choose?